SHAME (!!!) and the Distant Echo of Durkheim Chanting Roll Tide! Alas, I shall relate my sad story. Back in November, I was involved in a panel discussion on teaching religion and sports. As a result of this, we were asked to write brief summaries of our courses. No big deal, I thought. The deadline was waaaayyyyy off in May, and it would only require about 1500 words. I just had to make sure that I didn't let it linger until the deadline. Yea... lingering. Deadlines. And here I am. Actually, I had tried to finish it about a month ago and... got sidetracked by stuff. It's always stuff. So this morning, I set forth to put this one downrange. I start by recounting my own early experiences in religious studies, when the only way that I could make sense of someone like Emile Durkheim was to reference sports. Unknown to me at the time, this would pave the way to me becoming more and more involved in writing about religion and sports, not to mention teaching it. From here, I describe the opening assignment in my course. We begin by getting a general overview of Durkheim's classic The Elementary Forms of the Religious Life. Then, we read and discuss Warren St. John's sports memoir, Rammer, Jammer, Yellow Hammer: A Road Trip into the Heart of Fan Mania. Finally, students have the job of applying Durkheim to Rammer, Jammer. If you are unfamiliar with Durkheim, Google it. Long story short, he sought to understand religion in terms of social cohesion. What is it about sports that turns otherwise sane, rational people into raving lunatics? Why does winning compel people to tear down goalposts, and losing, to drown themselves in bad keg beer? In short, why do fans care? In search of the answers to these questions, Warren St. John seeks out the roving community of RVers who follow the Alabama Crimson Tide from game to game across the South. A movable feast of Weber grills, Igloo coolers, and die-hard superstition, these are characters who arrive on Wednesday for Saturday’s game: Freeman and Betty Reese, who skipped their own daughter’s wedding because it coincided with a Bama game; Ray Pradat, the Episcopalian minister who watches the games on a television set beside his altar while performing weddings; John Ed (pronounced as three syllables, John Ay-ud), the wheeling and dealing ticket scalper whose access to good seats gives him power on par with the governor; and Paul Finebaum, the Anti-Fan, a wisecracking sports columnist and talk-radio host who makes his living mocking Alabama fans—and who has to live in a gated community for all the threats he receives in response. 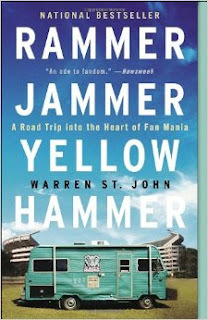 In no time at all, St. John himself is drawn into the world of full-immersion fandom: he buys an RV (a $5,500 beater called The Hawg) and joins the caravan for a football season, chronicling the world of the extreme fan and learning that in the shadow of the stadium, it can all begin to seem strangely normal. I find that this opening assignment helps me to chip away at the common understanding that religion is "belief in God or gods." This is a challenging intellectual leap for most of us to make, since we are so firmly conditioned to think of religion in terms of personal piety and individual spirituality. For my money, nothing illustrates Durkheim better than some dude with a Bear Bryant tattoo on his shirtless chest yelling "ROLL TIDE!" I will try not to dwell on that for too long. Because more SHAME (!!!!!) awaits.